A video from a couple of years ago has begun circulating on Reddit, the Internet's favorite place to not let anything cool die, featuring a special look at Star Wars: Episode IV - A New Hope. It's special because there's a taped audio recording (you can even hear the squeek of the tape!) overlayed upon the video of the film, featuring the sounds of an audience witnessing Star Wars for the first time in 1977, before there was hype and a million wikipedia pages, hundreds of novels and comics and video games - when it was just plain Star Wars, and it was brand new. The video comes from Homer Thompson, who made it in 2015 based off an audio recording previously uploaded. 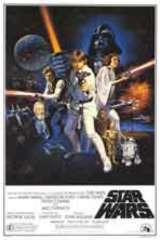 The audio was from William Forsche, who said, "This audio was recorded in 1977 when my mother took me to see Star Wars. Hearing her laugh and cheer with me and the rest of the audience is absolutely priceless to me." It's a blast to see and hear, and if you put on some good headphones, almost feels like you're sitting in the theater yourself. There's something so pure about the joyful first-time discovery of Han's big moment, and Luke's success, that as much fun as it is to watch for the 10th, 20th, 100th time, only the first viewing can provide.